Last night, the museum was highly commended in two categories at the Museums and Galleries National Awards (MAGNAs), which took place in Melbourne during the Museums Galleries Australia national conference. 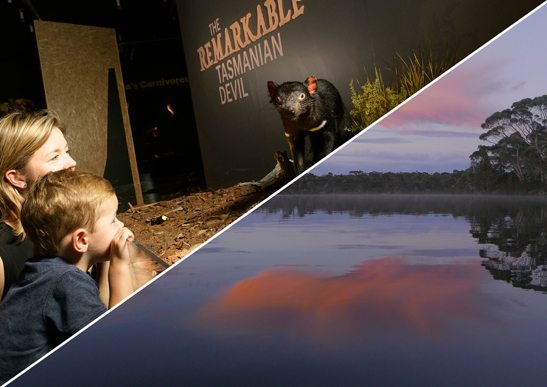 TMAG was highly commended in two sections of the Temporary and Travelling Exhibitions category for 2017 video and photography exhibition The Derwent and for 2017-18 natural science exhibition The Remarkable Tasmanian Devil. Director Janet Carding was in Melbourne to accept the honours, and said the success in this year’s MAGNAs follows on from TMAG’s multiple wins at the awards in 2017. “It is wonderful to be recognised once again by our peers in the museums sector for our exhibition program,” Ms Carding said. “At TMAG we aim to present exhibitions that tell Tasmania’s stories and represent our unique environment, culture and heritage. For more information about the MAGNAs, and a full list of winners, visit the Museums Galleries Australia website.